In the Netherlands, in addition to the snackbars, one can also find street stalls selling different fried, smoked and raw fish products called a “viskraam”. Besides the popular raw herring served with chopped onions, these stalls also sell fish products such as smoked mackerel, smoked eel and “kibbeling” (deep fried cod nuggets). Kibbeling is a snack consisting of pieces of cod in a batter of flour and egg, dipped and then fried. The high price of cod is now often worked with other species such as pollack, whiting. 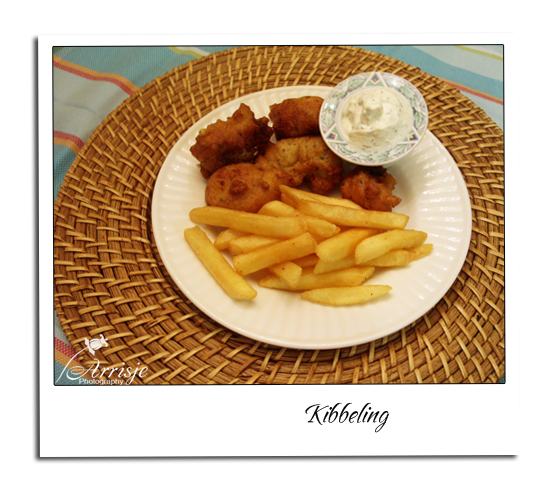 Kibbeling is often eaten with garlic sauce or remoulade. “Kibbeling” is a corruption of the word “cod cheeks.” These cheeks are cut separately and were once as “kibbeling” offered. Later the belly pieces of large minnows (cod, pollock, etc.) are also sold as “kibbeling”. When you make this Kibbeling do not use a deep fryer with a mesh basket. I found out the hard way, the battered fish kept sticking to the basket. So the next time I make it I will use a deep skillet. Rinse the cod in some water. Mix your fish seasonings. Cut up the cod in bite size pieces then mix the milk, flour and egg. 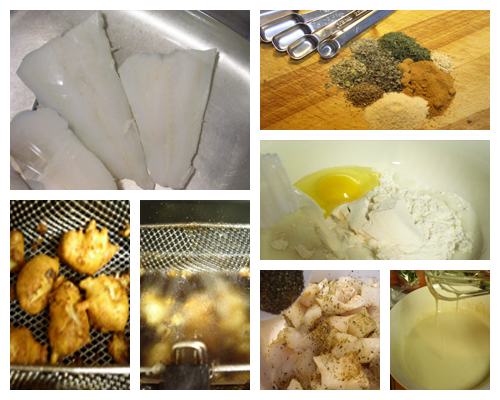 Add your seasoning mix to the cod. In the meantime heat the canola oil in a deep skillet 375F. 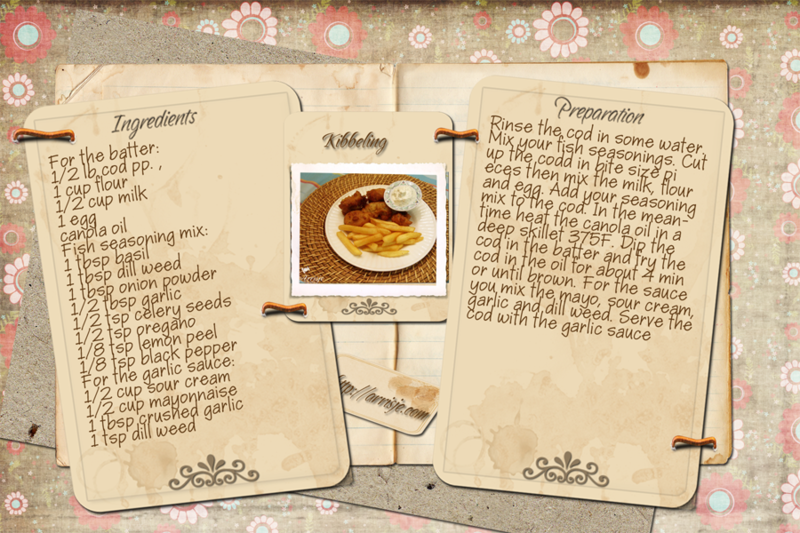 Dip the cod in the batter and fry the cod in the oil for about 4 min or until brown. For the sauce you mix the mayo, sour cream, garlic and dill weed. Serve the cod with the garlic sauce.